One of the most powerful growth engines and SaaS metrics to track is net negative MRR churn. When you have net negative churn, the additional revenue you generate from your existing customers month over month is outpacing the revenue you're losing through cancellations and downgrades. While it's always preferable to have a low gross churn rate, achieving net negative churn means that your business can not just survive but continue growing through a period of higher-than-normal churn or lower-than-normal customer acquisition. Engineering net negative churn into your SaaS business from the start means you practically have an unfair advantage. What is Net Negative Churn? Net negative churn is achieved when the total additional revenue generated from existing customers is greater than the revenue lost from cancellations and downgrades. When your recurring revenue grows without the addition of new customers, you’re achieving positive net revenue retention. 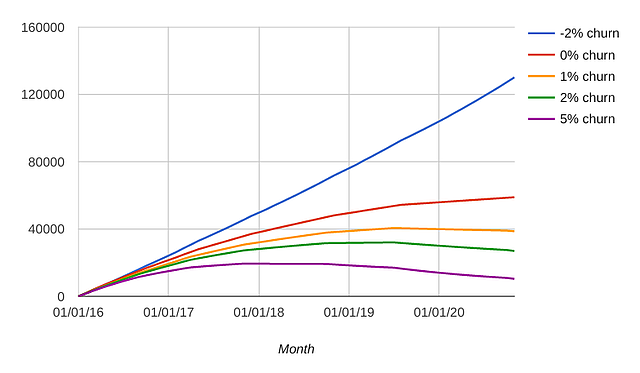 But the reason Front is doing so well is more about that little red line indicating their net MRR churn—it's negative, which means the MRR they're generating from their existing customers has outpaced what they lose to churn. This tells us that Front is generating enough expansion revenue from their current customers—seat upgrades, as well as upsells to their enterprise plan—to continue growing even without new customer acquisition. 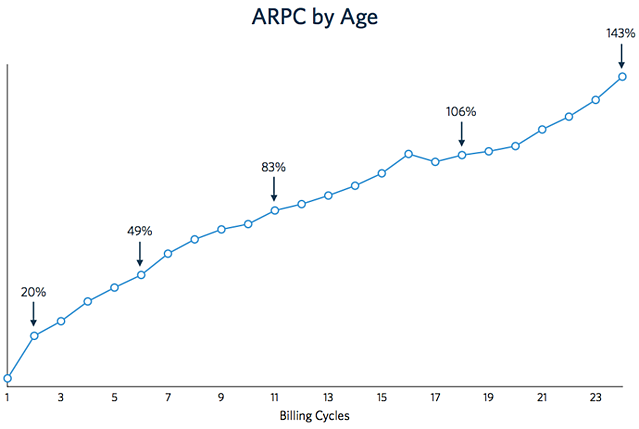 Most SaaS companies with high customer churn and acquisition simply sign up logo after logo with no perceptible change to their revenue—Front on the other hand, increased their MRR more than 5x over the course of a year because their customers spent 50% more, on average, after twelve months signed up. To get net revenue churn, we're going to subtract all MRR gained from expansion (upsells and cross-sells) from that number. That will tell us whether we wound up in the red or the black by the end of the month. 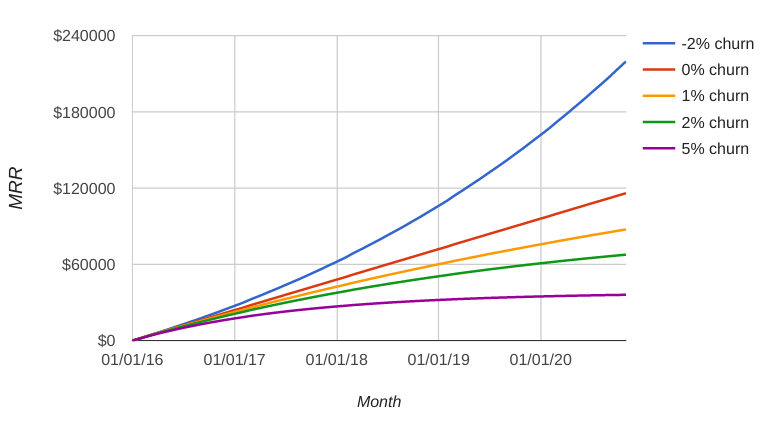 To get a net revenue churn rate, we simply divide that number by the End of Month MRR from the previous month. Most SaaS companies overestimate what an “acceptable” churn rate should be and if you look at how net churn affects MRR, you can understand why. The business with 5% monthly churn flatlines despite constant growth, while those with 1% or 2% see their growth stunted. Only the business with -2% net MRR churn is able to generate exponential growth. The business with -2% net MRR churn continues to thrive because it doesn't rely on new acquisition to grow. New customers merely accelerate the existing growth curve. All of the mechanics of growth are built in. Upselling is about selling a customer a more powerful, more expensive version of the product they have. With a help desk like Help Scout, the more team members you can key into your support pipeline, the faster you can respond to customers and the more teammates you can keep on the same page, thus improving customer success. Wistia makes it incredibly easy to imagine growing with them because of their extremely simple value metric—make a couple videos with our Free plan, make more videos with our Pro plan, and then even more with our Premium plan. All it takes is that first taste of their success, which their Free plans let you have gratis. Once videos have been proven to have an effect on conversion rates, $100 a month for 150 videos is irresistible. Making sure your product can grow alongside your customers doesn't just mean offering more power on more expensive plans—it means aligning each upgrade so that success with one step means a natural transition to the next. 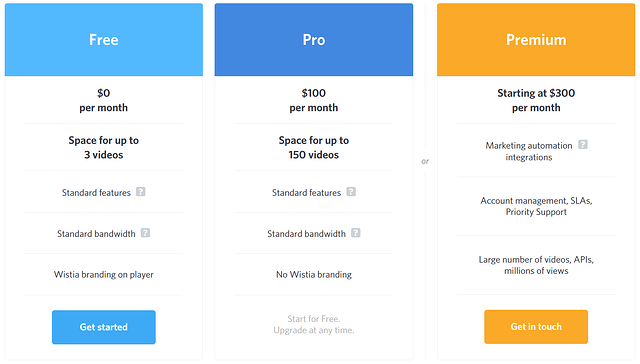 Wistia has been helping businesses do video for over a decade, so it makes sense that they would have the rhythm of the typical business's adoption of video baked into their pricing like this. When you cross-sell, you give your customers additional value with different features and side products. Twilio drives a ton of expansion revenue through the sale of services that are related to their main API, which companies use to do voice and video messaging. If you want a smart task routing API to send the right service requests to the right people, they sell TaskRouter. Need Elastic SIP Trunking? Get it. From international coverage to network traversal, their product catalog is extensive and a powerful driver of revenue. In their S-1, Twilio reported their Dollar-Based Net Expansion Rate (change in revenue, for a specific customer cohort, from one year to another) to be 170%, 153% and 155% for the years 2013, 2014, and 2015 respectively. In other words, each year Twilio's customers generated about 59% more revenue than they did the year before. Each one of these APIs feeds into the hunger for data that rules marketing and sales but performs a different function, sometimes for a different kind of team, at a different point in the pipeline. If you're doing lead gen, you might use Discovery to work up a list of nonprofits in Africa that have >20 employees. A primarily-outbound sales team might look to Prospector to find the perfect engineer at Twilio or marketer at HubSpot. The marketing team might pass a list of leads through the Enrichment API to understand the location, industry, employee count and total raised by the companies that are buying (or not). Through this diversification and a handy Segment integration, Clearbit has tons of ways to get into an organization. Whether you're a growth-hacking developer, an email marketer or a sales lead, you can probably find some use for Clearbit on your team. Once that first contact is made, Clearbit can cross-sell to other people inside the organization with different roles and different needs. It's the classic Land and Expand strategy, except with a handful of different products rather than just one. Achieving net negative churn is an incredibly powerful way to lay the foundation for a great business. Tom Tunguz compares the customers of companies with net negative churn rates to “high-yield savings accounts” and it's an apt comparison. With net negative churn, you can weather a slowdown in customer acquisition and even an otherwise-deadly rate of user churn. You gradually increase your average revenue per customer because they're paying you more each year, which gives you the dry powder to go after even higher-value customers. Most importantly, net negative churn is a positive sign that you've successfully aligned your business model with your value metric, creating a self-sustaining flywheel of growth. P.S. We believe so firmly that solving retention is one of the keys to SaaS success that we built a product that does exactly that. We’ve found that 20-40% of most SaaS companies have unnecessary churn due to delinquent credit cards. We can help you fix that. Check out ProfitWell Retain.